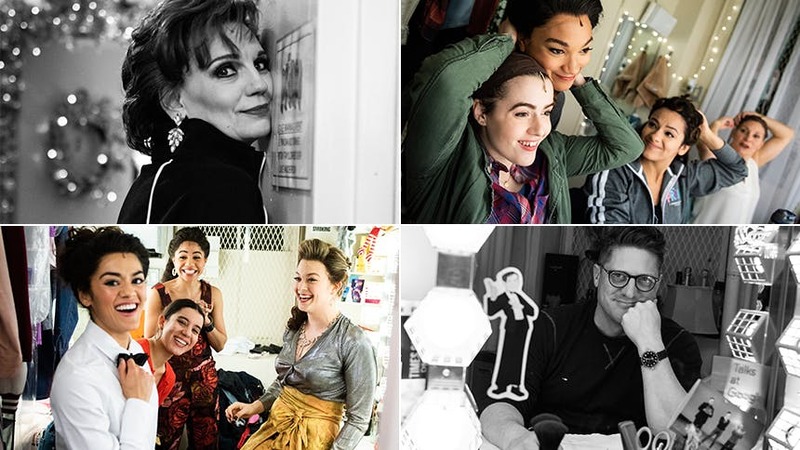 Photographer Jenny Anderson (who shot our Classic New York Films and our Broadway Replacement Stars series) brings BroadwayBox backstage for an exclusive series capturing Broadway companies getting ready to take the stage. Most recently, Jenny went backstage at Broadway's Longacre Theatre, home to our favorite musical of 2018, Broadway's acclaimed, new musical comedy The Prom. Scroll on to see this incredible company preparing to bring joy and laughter to Broadway audiences. Let’s kick it off with The Prom queen herself, Tony winner Beth Leavel, whose performance as Dee Dee Allen must be seen to be believed. Then we head over to the dressing room of two-time Tony nominee Christopher Sieber, who lands laugh after laugh as Trent Oliver. Next stop is Caitlin Kinnunen’s dressing room. The Spring Awakening and Bridges of Madison County alum stars as Emma, the teenage lesbian from Indiana at the center of The Prom. This dressing room is home to Caitlin, Isabelle McCalla, and Courtenay Collins…so obviously it’s the place to be pre-show. Isabelle McCalla stars as the picture perfect Alyssa Greene, Emma’s closeted girlfriend caught at the crossroads. Atlanta actress Courtenay Collins makes her Broadway debut as the close-minded Mrs. Greene in The Prom. Funny Man, a musical comedy about Josh Lamon and his time in the Ziegfeld Follies. Honestly, this is a cover photo. The longer you look at this photo of Angie Schworer & Beth Leavel in their dressing room at The Prom, the more it reveals itself. It's beautiful. Angie Schworer is serving major face and all that zazz. The Prom stars Caitlin Kinnunen and Brooks Ashmanskas cram some last minute screen time before the train leaves the station. Ok, is that a Blanche from The Golden Girls one piece in Joomin Hwang’s hands? And do they sell it at the merch stand? It’s standout dancer Anthony Norman! Check out his awesome Thanksgiving Day Prom takeover here. Bye, boys! Next stop the girl’s dressing room. Over in their room, the ladies get into the opening night attire for the top of the show. The people that comprise The Prom ensemble are some of the fiercest dancers you will find on Broadway. Caitlin Kinnunen is officially wigged! Let’s start this show. Likewise, Isabelle McCalla is just about ready to take the stage as Alyssa Greene. Josh Lamon descends the stairs Dolly-style in one of his incredible, patterned suits. It’s officially places! Hurry to the Longacre Theatre to experience Caitlin Kinnunen and the entire crew in the must-see musical comedy The Prom.